I confess that this is one of the interviews that I have most enjoyed in my life. Despite its apparent simplicity. Stephen Wilkins’s passion captivates us with the power that daring dreams have. This is not unexpected. Like most adventurers, he is also a poet. The oceans, the high latitudes, Cape Horn, the strong winds and the big waves, the pitfalls not shown on charts, the salty foam, the albatrosses following the sailboats for days, the sea that borders the frost and desert plains of the South Pole, the Antarctic sea, all this is a part of him. All of this is Stephen Wilkins. Once his eyes were the same colour of the blue lakes of Mount Gambier. Like poets, he is shy, but as we know: he does not dare to imagine that his eyes are now like the ocean he so deeply loves. A: I was born in the SE of South Australia in a city called Mount Gambier, where my father was based as an engineer, famous for its two blue lakes, I gather that why my eyes are this colour. A: On leaving high school I studied hotel and restaurant management, which is the profession I worked in for 5 years before changing to advertising and marketing. My love for the sea has always been there and I started studying my maritime qualifications, my highest level in this is merchant captain to 7,000 gross tons, and yacht master ocean examiner commercially endorsed. - How everything began? How did your passion for the sea, adventure, sailing, boats started…? A: As a family we lived in Papua and New Guinea for 4 years, I remember as a child first trying to build my own boat out of the packing crates that our belongings were shipped there, I was five years of age. - When and where did the great voyages begin –those you did not return to the same port of departure? How was that first long voyage? A: During my childhood, we traveled in cruise ships where I was horribly sea sick, I did start coastal sailing in my teenage years, and also were very sea sick, but I perservered, I really started to enjoy off shore sailing in my 20′s and competed in ocean races like the Sydney to Hobart in Australia before I commenced sailing over seas. - Which other long-distance voyages have you carried out? A: I have now sailed nearly 400,000 nautical miles (about 750,000 kilometers) my voyages have involved round the yacht race BT Global challenge in 2000 as skipper and since 2003 I have been skipper and expedition leader doing High latitude expeditions to Antarctica and southern ocean remote islands. - What are you doing right now? 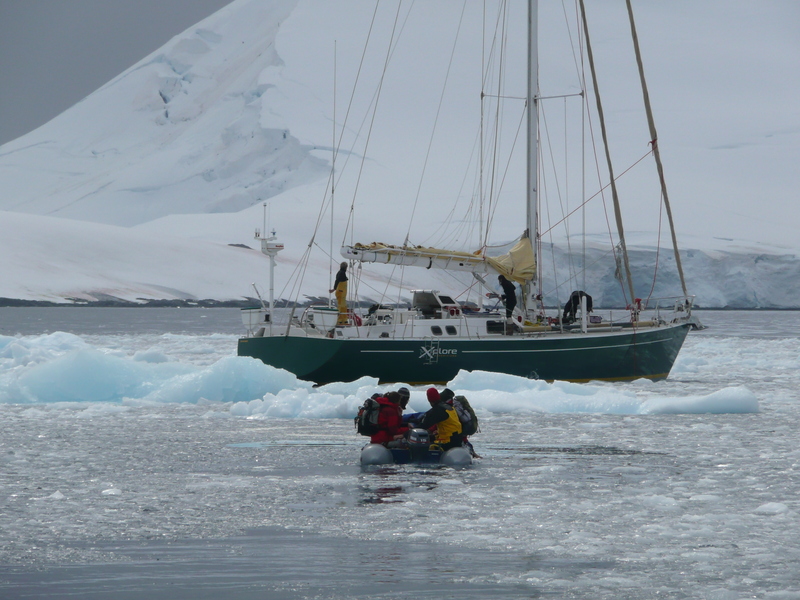 A: As I write this, we are currently on route to South America where we have a busy southern summer of expeditions including a French sailing documentary around Cape Horn, a British navy historical expedition to Antarctica and South Georgia and a number of other expeditions. My time in Europe for the last 18 months has been working on a continuation of the hydrographic works we have been conducting in Antarctica, the plan is to continue surveying remote locations around the globe for an initial 3 year period. - Which projects do you have? What would you like to do that you have not done yet? - What experiences you have lived in the sea that you would have preferred not to? A: Most people would think that rough weather is bad, but if you are in a safe and well prepared yacht, tough weather can quite exciting, enjoyable and exhilarating. There are of course bad days and experiences that you would like to forget, like, we were stuck hard on a unchartered rock in South Georgia one year, the stress and the issues with being grounded in a remote location, no assistance possible and a long way from port. we managed to repair and recover but this is a day I would have preferred not to have happened. - What lasting unforgettable memories you have at the sea? What do you remember most fondly? A: An easy answer, the break of day light in the mornings would have to be my favorite, but there are so many magical moments at sea, and where we do expeditions, words and photos just cannot ever do justice to them, you just have to try it yourself. - When hearing the word “adventure”, what is the first thing that comes to mind? What do you imagine first? A: Adventure is possible each and every day, for anyone. Adventure in my mind is being comfortable and confidant to step outside our comfort zones of what we consider “Normal”, as you practice this more and more then you realise how we constrain ourselves, and limit what is possible. - How as your stay in Yacht Port Cartagena? A: Our visit to Cartagena was one of the highlights to our time in the Mediterranean, we had a busy schedule with meetings in Monaco for the new project, so what I looked for was a small city that still had all the facilities that you could want to do the final preparations for this ocean passage. The city is so historically interesting, the people kind and genuine, the food and restaurants are wonderful, along with very realistic and reasonable prices, I could not have asked for more. - Is there anything else you would like to add that I have not asked you? A: I can only encourage any person of any age to make sure that your life dreams are not forgotten or lost, life is very short and to leave things to later will probably never happen, dream the dream, then do it has been an important motto to me for years, it works, world and life discovery is there for everyone.